The military government in Thailand aims to position the country as the gateway to ASEAN and has announced to support the logistics sector by strengthening the infrastructure and implementing trade-friendly policies. Ministry of Transport’s Infrastructure Development Plan (2015-2022) approved by the cabinet calls for an investment of at least THB 1.8 trillion (USD 51 billion) for 20 mega-projects in all modes of transportation, covering roads, rail, air transport and ports throughout Thailand. Thailand has signed multiple free trade agreements (FTAs) with large economies like China, US, India, and others and as a WTO member since 1995 has been open to foreign firms operating and manufacturing from Thailand thus helping it to have a trade surplus over the years. Growing investments by the government in logistics infrastructure and enhancing economy presents a highly favorable environment presents highly favorable freight forwarding and warehousing market in the country. For instance- Thailand’s agreements with the ASEAN community have led to an increase in cross-border freight transportation via roadways and ports without any major limitations. Roadways have gained attraction in Thailand due to its superior road network, thus becoming the first preference for moving freight within the country with a vast presence of local freight forwarders coupled with trucking fleet operators. Further, it has become a manufacturing hub for various industries including automotive, retail, pharmaceutical and agriculture. In addition to this, express services are likely to become more significant in the near future as Thailand’s economy becomes increasingly integrated owing to rapid growth in international trade services. Growth in the E-commerce industry will drive the express delivery market owing to the rising demand of this service for the B2C business segment. In addition, given the benefits of reduced delivery time, the growing preference of just-in-time approach for inventory to reduce inventory costs, the need to minimize loss of sale opportunities, and the rising end-consumer demand for quality logistics services, express delivery services are increasingly becoming the preferred mode of logistics for a large number of users in the country. 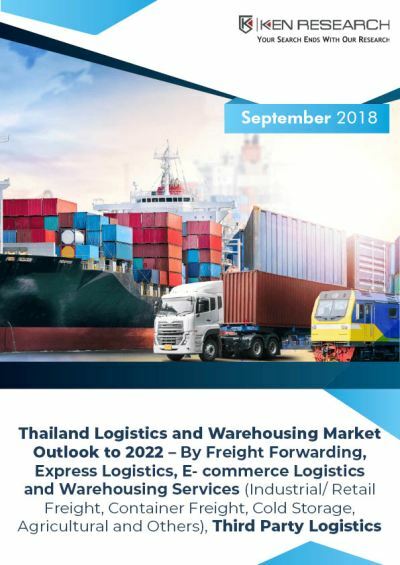 Ken Research in their latest publication “Thailand Logistics and Warehousing Market Outlook to 2022 – By Freight Forwarding, Express Logistics, E-commerce Logistics and Warehousing Services (Industrial/ Retail Freight, Container Freight, Cold Storage, Agricultural and Others), Third Party Logistics” believe that increasing the number of channel points, strengthening infrastructure connections, improving service quality in terms of training the personnel and promoting railways for freight transportation will have a positive impact on market. Thailand logistics market is expected to register a positive CAGR of 3.9% during the forecast period 2017-2022. The report titled “Philippines Logistics and Warehousing Market Outlook to 2023 – By Freight Forwarding, Warehousing, Express Logistics, E-commerce Logistics, Third Party Logistics, Balikbayan Box Segment” provides a comprehensive analysis of logistics and warehousing services, express delivery, e-commerce logistics, 3PL and Balikbayan box industry. The report also covers the overall competitive landscape; government role and regulations, SWOT analysis, growth drivers, trends and developments. The report concludes with future projections and analyst recommendations highlighting the major opportunities and cautions. The reports cover overall size and future outlook of Indonesia logistics, freight forwarding, warehousing, cold chain, 3PL, and express market in terms of value, segmentation on the basis of service mix, by geography and by type of industries. The report also covers value chain analysis for logistics market, comparative analysis of Indonesia logistics market with few APAC countries and global logistics market. The report also covers the competitive landscape of the industry and comprehensive profile of leading and emerging players operating in the market. The report focuses on Vietnam freight forwarding market by normal and express delivery, by freight movement (sea freight, road freight, air freight, and rail freight), by international and domestic freight forwarding and by flow corridors (Asia Countries, European Countries, American and African Countries); Vietnam warehousing market by number of warehouses (Southern Vietnam and other regions), by end users (retail, electronic devices, textile and footwear, wooden products and others), by international and domestic companies and by business model (industrial freight/retail, container freight, cold storage, agriculture and others). The report further provides insight on Vietnam express delivery market by international and domestic express, by air and ground express and by market structure (B2C, B2B and B2C) along e-commerce logistics business by channel (3PL companies and e-commerce merchants), by speed of delivery (2 day delivery, 1 day delivery, same day delivery, within 2 hours and delivery beyond 2 days), by area of delivery (intercity and intracity) and by payment method (cash on delivery and others). The report provides statistics on Vietnam 3PL market by freight forwarding and warehousing and by international and domestic companies.